Is your Exchange Server became corrupted and damaged? So you can use the best Enstella Exchange Server Recovery Software that quickly repair corrupted Exchange Server database and recover Exchange Server emails, contacts, calendars, task, notes, inbox items, outbox items, outbox items, journals and appointments. By taking help of Exchange Server EDB Recovery Software you can recover Exchange database and convert them into PST Outlook file along with email properties- to, bcc, cc, time, subjects and from, email header information, embedded images. Superb Exchange Recovery Software faultlessly recover Exchange Server and convert them into PST. Software gives messages filtering option to recover emails by dates “From date” to “To date” to recover emails and import them into PST Outlook file. 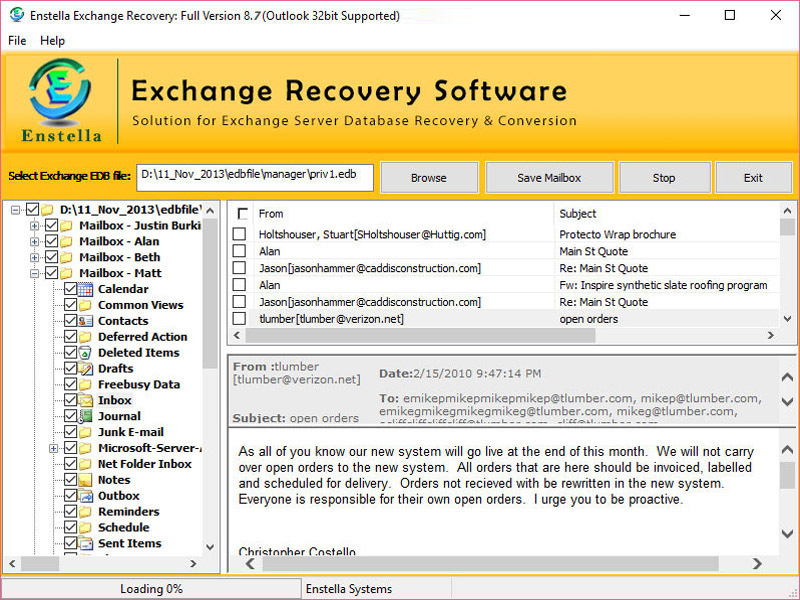 Exchange Recovery tool helps to recover selective single OR multiple emails from EDB File and Convert EDB to PST file, EML, MSG and HTML format. You can use demo version of Exchange Server Recovery Software which shows the complete recovery process and facilities to restore 25 emails per folder into each format at free of cost but to restore complete EDB file you have to download full version of the software.